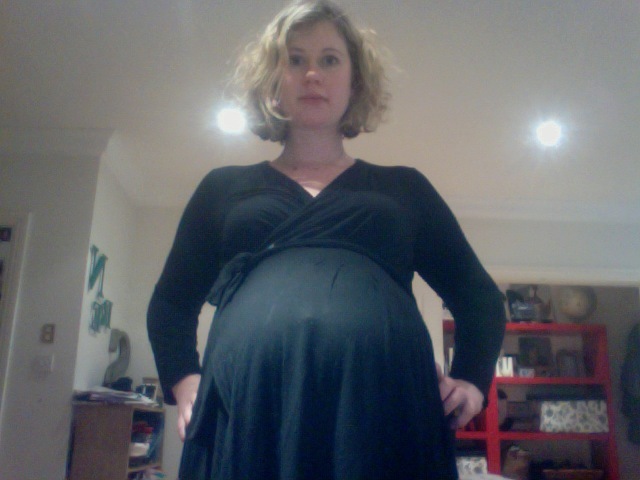 I am not in labour yet, and I am three days overdue. I am well, except for the elephantitis legs, the pelvic pressure which is like there is a huge big fat baby pressing on my bits (oh, wait, there IS) and I am a bit of a Jekyll and Hyde. You just never know if I am going to hug you and offer you lovely chicken sandwiches and coffee and newish magazines to take home with perhaps a freebie mascara chucked in for feelgood factor, or if I will start crying at you and maybe throw something at the wall. Sometimes the kids, but mostly not. The bladder has been struggling, and it seems has given up the fight, which works so well with this persistent and nasty cough that takes me by surprise every few minutes. Between a houseful of small wees-dribbling boys and now me, it is surprising anyone can actually step in through the front door. Oh! The ammonia! The shame! So, tomorrow is Barnaby’s birthday and we are off to Bramley’s for some soft-play fun with 14 kids. I have been baking today which was Very Hard For Me because my baking skills are very babyish. I burnt the top of the cake and ruined some shortbread buttons which melted (melted?) in the oven, but had some success with chocolate cupcakes. What is left tonight is to wrap the Transformer, the Lego truck, the WikiStix and the pirate thing, and to figure out how to make red icing for the spiderman cake face, and to, er, maybe squeeze out a baby. We shall see. Thats quite some list. I don’t think you have time to be pushing out a baby tonight. Ammonia smell here too… not from me though. You are looking fab – makes me want to pop over and visiting knowing there’s the off chance I might make it out with a magazine and mascara! All the best with the cake… I’ve burnt the top before and just cut the burnt bits off. How in the world did you melt shortbread?? We are waiting for the news. Happy Birthday Barns for tomorrow (or today on our side of the world). Lets hope bubba doesn’t come until after the candles have been blown out! Your neck is lovely. I don’t think you have time for a baby today either, and also it would be good if 2 of 4 kids would not share a birthday for all time. Assuming it is B-J-F’s birthday tomorrow and not just the party day. In the next blog I expect there to be a picture of both baby and cake, please and thank you. I too have been making birthday cake today, not for my childer but another. He is one. Soon I will be making Jono’s #1 cake- #1 maybe for the last time? I too will be all full of the wistfullness if not careful. Oh GOOD LUCK for the birthday and the birthing. May both go well and both not have too much screamishness. Happy birthday to Barnacle Jack! “she a genius. worked with all kidlets so far – ned noodle going to be next – whatever the detractors say, it gets you sleep!” Please please tell me what this secret is!!!! WHAT gets you sleep?! !